UPDATE: WATCH LIVE NASA TV BROADCAST BOMBING ON THE MOON. Excuse my word in the title 'Bomb' the moon, but I couldn't find any generic word than that with what NASA folks are doing this coming Friday, October 9th 2009. This is NASA's year long planned mission named LCROSS(Lunar Crater Observation and Sensing Satellite) which is finally taking place the day after tomorrow. This historic moment will be showcased live herein US at 6:15AM EDT and 3:15AM PDT on October 9th, 2009. I'm on 3:15AM zone, so, will set the timer to wake me up to check that event out live on NASA channel. Well, I don't know if it's the continuation of the same old top secrets that US long ago planned to show it's might by dropping nuclear bombs on the moon during the cold war or if it's geared towards scientific research. They've claimed that this is for finding water on moon in general term but it sounds vague and mysterious when scientists from India already confirmed the traces of water on the moon many years ago. Whatever the cause, it's quite a dilemma for now. But, I'm quite excited for sure to see the results. Should we let them happen this? I should say YES. Till now, most of the theories and statements are based upon delicate obscured researches and fictions. When we are ignorant of the things beyond our understanding, we human nature tend to shape it in our own way and give it several names. When I read many science books, most of those things are based on that, same hypothetical stuffs without much base and proof. Science has ability to prove every single things happening in the universe. BUT IT'S NOT YET READY to do that SOLID. All the big bang theories, parallel universe, multiverse etc are mere assumptions of scientists who calculated things on their own way. We have no other choice than to believe and follow it. Before Galileo, everyone believed Sun revolves around Earth. We need someone like him in every generation who could unfold the mysteries of universe bit by bit with rock solid proof. 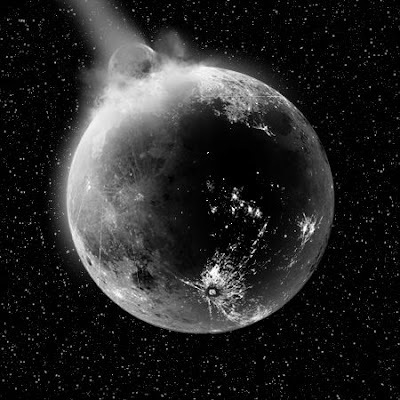 To me, causing some explosion on Moon's surface to find out the real deal is permissible. This is one step forward for entire humankind to see progress towards demystifying the secrets of the universe. So, let's cheer and see what happens next. Right now in science communities, there are serious discussions going on all around the globe regarding this bombing. Half of them are opposing this whereas half of them are supporting it. Those who supported were quite excited like me but some of those comments were real eerie. We cannot deny the fact that other lifeforms also exist together with us in this universe. If we earthlings can step forward to reach on the surface of the moon, there are possibly other species from another planets hungry for knowledge of their existence, just like us craving for knowledge. It's nothing but the extreme of foolishness to believe that we're the only lifeforms in this entire gazillions of galaxies. So, how will it happen?? In simple term rocket will be launched from somewhere in Florida, headed towards the moon and then some part takes off from the rocket from where the rocket will enter the orbit of moon, after revolving moon for some time, it'll hit the designated crater of moon double the speed of the fired bullet and cause some explosion which will scatter the debris from the moons surface and the other part of the rocket will take the snap shot and do their job confirming if it's indeed the water particles or other substances. For more detail observation of all this, click here and click here for more info on which crater the explosion will occur upon.